Are you are looking for the best web pages about a specific topic? With StumbleUpon you’ll always find them. Simply highlight the desired word, press CTRL + C or right click ->Copy, and select the StumbleUpon icon from the click.to menu above your mouse pointer. This brings up a list of suitable websites that you can select from. 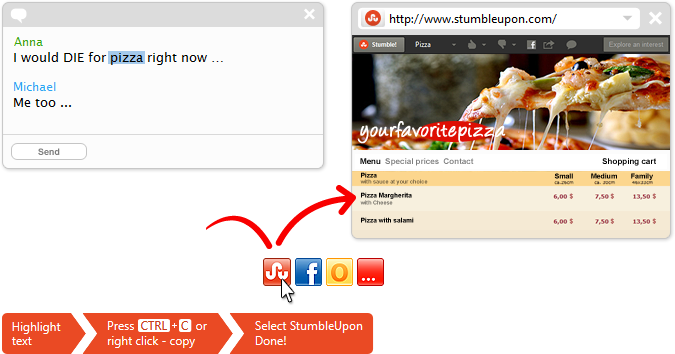 Are you are logged in to StumbleUpon and want to add a website you found to StumbleUpon? click.to does it in record speed! 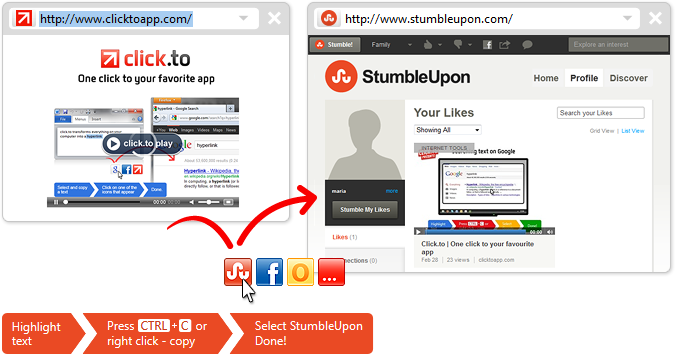 Once you have click.to installed, all you have to do is highlight the URL, copy and send it to StumbleUpon with a click on the StumbleUpon icon over your mouse pointer!